Switching to LED lighting in the office is a fantastic way to become more energy efficient and reducing your energy usage and costs up to 80%. Whilst we continue to talk about the huge cost savings and environmental benefits of LED Lighting there are many other benefits of office LED lighting with overall business and employee benefits in the workplace. There are several studies and reports being published showing the positive effects of LED lighting and how its effects influence human energy, mood, vitality and work performance. Studies in US and Europe have revealed that by simply switching to LED lighting and providing a better light environment can increase work performance by at least 3%. With these performance gains achieved as well factoring in the energy costs that will be saved, work performance gains can also influence the financial cost of the LED lighting installation project. The leading reported issues by office employees from fluorescent lights are glare and eyestrain which is also a major cause of headaches. This is dramatically reduced with more efficient LED lighting. 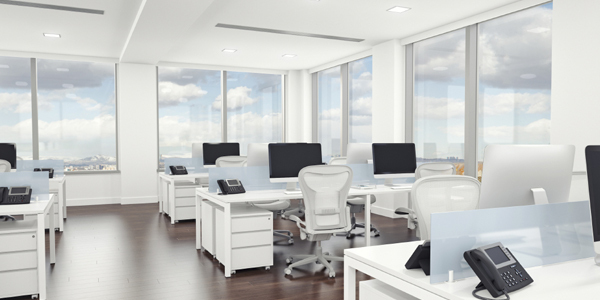 Studies show that office workers perform better in specific lighting levels. This is greatly achieved with intelligent LED lighting and the ability to control Lux levels. Whilst natural sunlight provides optimal lighting, Intelligent LED office lighting is the closest alternative to provide natural lighting office environments increasing energy, mood and vitality. Increased production in the workplace with a reported 5% increase in reading speed and a reduction in spelling errors. When you combine all the benefits of switching to LED lighting in the office, studies show LED lights can be a very important source of savings with work productivity increased, increased health, happiness and overall morale of office employees and an overall better office workplace together with energy savings up to 90% by switching to LED lighting. It simply makes sense. Switching from traditional office lighting to LED lighting has never been easier with fully financed LED lighting “pay through your savings” packages available with UK Energy Lighting.